Human beings are always fascinated by the ocean. It offers so many possibilities of a different world and species. Part of this strong interest that we have on the waters is how drawn we are with the mystical species down under like mermaids. These alluring creatures have been a part of our folklore culture that we immerse them even in important events. 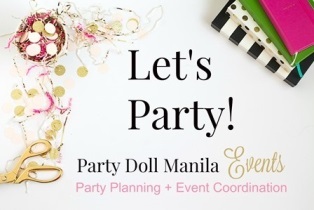 This is what Party Doll Manila Events and Party Magic did exactly on Olivia’s first birthday bash. Cradle and Lemon Three Films did a great job in capturing all the happy moments in this one of a kind birthday bash. These invites were sent out to Oli’s friends to let them know about the upcoming party under the sea. From this cute little card, you can already smell the sea breeze. Every guest was welcomed by the mermaids clinging to this pastel colored balloon arch. What made it more attractive is the huge clam and starfish on its side. The ceiling drapes, paper lanterns and hanging jelly fishes put together made an awesome view when looking up. Its gentle lighting makes up the perfect charm for it. Filled with marine life and with the sea goddess in the middle, the stage is all set to grace the celebration. It’s even more beautiful in full view. The table centerpieces were composed of a jellyfish, a mermaid and fresh flowers. The shade of blue on its cloth gave it an aquatic vibe. Sugarplum Pastries made a real sea attraction from this cake. By its nitty-gritty details, it looks like a sight from an oceanarium. I can think of a cave full of treasures in the water world when I see the dessert spread. Every single sweets portray the vibe of the ocean. Everyone was thrilled to see Ariel, Attina and Ursula singing! The kids couldn’t be happier. Madison Events put up a great show to make sure that the spirit of celebration is high. The little ones had their energies gushing during game time. Look how excited they were to pull that pinata! Candies overload! Moms were also entertained by the contest prepared for them. Those big laughters show their delight. Thanks to these activity booths by The Party Project, no kid got bored. The builders and artists in them were brought out by these kiddie nooks. The photo-op corner is a real haven. Anyone can be a pearl on that gigantic but squishy clam. It made the perfect background for Olivia’s friends who dressed up well for this day! Family and friends will surely remember this day when they sleep on this oh so cute pillows! Oh Olivia, you are a precious little mermaid!